WestJet Airlines Ltd. is a Canadian airline founded in 1996. It began as a low-cost alternative to the country's competing major airlines. WestJet provides scheduled and charter air service to 100+ destinations in Canada, the United States, Europe, Mexico, Central America, and the Caribbean. WestJet is currently the second-largest Canadian air carrier, behind Air Canada, operating an average of 777 flights and carrying over 66,130 guests per day. In 2018, WestJet carried 25.49 million passengers, making it the ninth-largest airline in North America by passengers carried. WestJet is a public company with more than 13,000 employees, and is not part of any airline alliance. It operates three variants of the Boeing 737 Next Generation family, the Boeing 737 MAX, as well as Boeing 767 and Boeing 787 aircraft, on select long-haul routes. WestJet has two direct subsidiaries, WestJet Encore which operates the Bombardier Q400, and WestJet Link, which operates the Saab 340B. The airline's headquarters is located adjacent to the Calgary International Airport. In 2018, WestJet had passenger revenues of CAN$4.733 billion. Founded by Clive Beddoe, David Neeleman, Mark Hill, Tim Morgan and Donald Bell, WestJet was based on the low-cost carrier business model pioneered by Southwest Airlines and Morris Air in the United States. Its original routes were all located in Western Canada, which gave the airline its name. On February 29, 1996, the first WestJet flight (a Boeing 737-200) departed. Initially, the airline served Calgary, Edmonton, Kelowna, Vancouver and Winnipeg with a fleet of three used Boeing 737-200 aircraft and 225 employees. By the end of that same year, the company had added Regina, Saskatoon and Victoria to its network. In mid-September 1996, WestJet's fleet was grounded due to a disagreement with Transport Canada over maintenance schedule requirements. The airline suspended all service for 2 weeks before resuming flights. In early 1999, Clive Beddoe stepped down as WestJet's CEO and was replaced by former Air Ontario executive Steve Smith. In July 1999, WestJet made its initial public offering of stock at 2.5 million shares, opening at $10 per share. The same year, the cities of Thunder Bay, Grande Prairie, and Prince George were added to WestJet's route map. In 2000, WestJet CEO Steve Smith was released from WestJet after 18 months in the position, apparently due to differences about management style; Smith went on to head rival Air Canada's low-cost subsidiary Zip. After Smith's departure, Clive Beddoe again became CEO of the company, a position he held until July 2007. WestJet Airlines at Calgary International Airport. Due to restructuring in the Canadian airline industry resulting from Air Canada's takeover of Canadian Airlines in 2000, WestJet expanded into Eastern Canada, beginning service to the cities of Hamilton and Ottawa, Ontario and Moncton, New Brunswick. The airline selected John C. Munro Hamilton International Airport to be the focus of its Eastern Canadian operations and its main connection point in Eastern Canada. In 2001, WestJet's expansion continued with routes to Fort McMurray and Comox. It also added Sault Ste. Marie, Sudbury, Ontario, Thompson and Brandon, Manitoba; however, service to each of these four cities has since been withdrawn. Service to Brandon, Manitoba and Sudbury, Ontario, was subsequently resumed by WestJet's wholly owned subsidiary, WestJet Encore. In 2002, the airline also added another two new Eastern Canadian destinations: the Ontario cities of London and Toronto. In April 2003, WestJet added Windsor, Montreal, Halifax, St. John's and Gander. WestJet entered into a two-year agreement with Air Transat in August 2003 whereby WestJet aircraft would be filled by Transat's two main tour operators, World of Vacations and Transat Holidays. These chartered flights operated largely to destinations in Mexico and the Caribbean and the planes were operated by WestJet crews. This agreement between WestJet and Air Transat was amicably terminated in February 2009. In 2004, rival airline Air Canada accused WestJet of industrial espionage and filed a civil suit against WestJet in Ontario Superior Court. Air Canada accused WestJet of accessing Air Canada confidential information via a private website in order to gain a business advantage. On May 29, 2006, WestJet admitted to the charges levelled by Air Canada and agreed to pay C$5.5 million in legal and investigation fees to Air Canada and donate C$10 million to various children's charities in the names of Air Canada and WestJet. In January 2004, WestJet announced that it was moving the focus of its Eastern operations from Hamilton to Toronto the following April, fully moving into the lucrative Toronto-Ottawa-Montreal triangle and tripling the total number of its flights out of Toronto Pearson International Airport. In 2004, a number of U.S. destinations were added or announced. These included San Francisco, Los Angeles, Phoenix, Tampa, Fort Lauderdale, Orlando and LaGuardia Airport in New York City. In early 2005, Palm Springs and San Diego were added to the company's list of destinations, while New York-LaGuardia was dropped. In April 2005, they announced new seasonal service to Charlottetown and ceased service to Gander. In fall 2005, Ft. Myers and Las Vegas were added to the growing list of destinations. In late August 2005, WestJet flew to Baton Rouge, Louisiana, transporting members of a Vancouver-based urban search and rescue team to assist with Hurricane Katrina relief efforts. After rumours and speculation surrounding the implementation of extended-range twin-engine operations (ETOPS), WestJet announced new service to the Hawaiian Islands from Vancouver on September 20, 2005. In December 2005, the airline began flying from Vancouver to Honolulu and Maui. WestJet's first scheduled service outside Canada and the United States began in 2006, to Nassau, Bahamas. This was considered a huge milestone within the company's long-term destination strategy and was a vital goal for future international market presence. In September 2006, Sean Durfy took over as President of WestJet from founder Clive Beddoe. On October 26, 2006, WestJet announced that it had its best quarterly profit to date, of C$52.8 million. WestJet's head office building at Calgary International Airport. In 2007, WestJet announced that they would begin flights from Deer Lake Regional Airport in Newfoundland, Saint John in New Brunswick and Kitchener-Waterloo in Ontario. In June 2007, WestJet added seven new international seasonal flights to Saint Lucia, Jamaica, the Dominican Republic, Mexico as well as a third Hawaiian destination; Kona. The same year, WestJet commissioned the construction of a new six-storey head office building, next to their existing hangar facility at the Calgary International Airport. The building was constructed following the Leadership in Energy and Environmental Design (LEED) Green Building Rating System, featuring a rainwater retention system and geothermal heating. The first employees moved in during the first quarter of 2009, and the building officially opened the following May. The WestJet Campus building was certified as LEED Gold standard in October 2011. In May 2008, WestJet launched daily non-stop service to Quebec City. The next month, WestJet commenced seasonal service between Calgary and New York City via Newark Liberty International Airport. In May 2009, the airline launched new seasonal service to the cities of Yellowknife, Northwest Territories and Sydney, Nova Scotia; service to Yellowknife was later extended through the winter of 2009-10. During the 2000s (decade), WestJet made significant gains in domestic market share against Air Canada. In 2000 it held only 7% to Air Canada's 77%, though by the end of 2009 WestJet had risen to 38%, against Air Canada's 55%. In late April 2009, WestJet temporarily suspended service to several of its destinations in Mexico due to the outbreak of influenza A (H1N1) in the country. The suspension of service to Cabo San Lucas, Mazatlán and Puerto Vallarta lasted from early May until mid-June, with seasonal service to Cancún being restored the following fall. In July 2009, WestJet announced 11 new international destinations for its winter schedule. These included expanded service to the United States, to Atlantic City, New Jersey, Lihue (Kauai), Hawaii and Miami, Florida. New Caribbean destinations included Providenciales, in the Turks and Caicos Islands; St. Maarten, Netherlands Antilles; Freeport, Bahamas; as well as the cities of Varadero, Holguín and Cayo Coco in Cuba. Ixtapa and Cozumel were also added to the list of destinations served in Mexico. In November 2009, WestJet announced service to the British island territory of Bermuda, which commenced in May 2010. WestJet also resumed seasonal service to Windsor, Ontario that same month. In March 2010, Sean Durfy resigned from his position as WestJet's CEO, citing personal reasons. He was replaced by Gregg Saretsky, a former executive at Canadian Airlines and Alaska Airlines and previously Vice-President of WestJet Vacations and Executive Vice-President of Operations. In July 2010 WestJet announced service to Santa Clara, Cuba, New Orleans and Grand Cayman bringing the total number of destinations to 71. Service to New Orleans lasted only one season and did not return the next year. In late 2010 WestJet announced it was wet leasing a Boeing 757 aircraft to expand service between Calgary to Honolulu and Maui and Edmonton to Maui, on a seasonal basis. A WestJet 737-800 taxiing at Phoenix Sky Harbor International Airport. Also that year, the Canadian Transportation Agency (CTA), an independent administrative tribunal of the Government of Canada that regulates airlines, found WestJet's baggage policies to be unreasonable and/or contrary to the requirements of the Canada Transportation Act and/or the Air Transport Regulations on several different occasions. On January 26, 2011, after Air Canada terminated California service, WestJet announced plans to enter service to John Wayne Airport in Orange County, California from Vancouver and Calgary starting May of that year. In November 2011 WestJet won an auction for time slots at New York's LaGuardia Airport ushering in a return to service to New York. Details of WestJet's scheduled service to LaGuardia were officially announced in January 2012. From 2012 to 2014, WestJet further expanded into the United States by adding Chicago via O'Hare International Airport, Dallas/Fort Worth International Airport, Myrtle Beach International Airport, and New York's John F. Kennedy International Airport. On November 15, 2013, WestJet announced their first destination in Europe. Seasonal service from St. John's, Newfoundland to Dublin, Ireland, would operate from June to October 2014. In January 2014, WestJet chartered an Atlas Air Boeing 747-400 to transport stranded passengers and luggage during the 2013 Central and Eastern Canada ice storm. The charter flew from Lester B. Pearson International Airport to Calgary International Airport. On July 7, 2014, WestJet announced that they were in the "advanced stages of sourcing" four wide-body aircraft that would begin flying by the fall of 2015. These would initially serve on the seasonal Alberta-Hawaii routes when WestJet's service agreement with Thomas Cook Airlines—who currently fly these routes on behalf of WestJet—expires in the spring of 2015. WestJet would take delivery of four Boeing 767-300ERs in summer 2015. WestJet took delivery of the first of these aircraft on August 27, 2015. On June 16, 2015, WestJet announced the launch service to London's Gatwick Airport which began on May 6, 2016. It is the carrier's third transatlantic destination after Dublin and Glasgow. The majority of flights to London uses the wide-body Boeing 767-300ER aircraft. On September 15, 2015, WestJet flights to London direct from Edmonton, St. John's, Vancouver, Winnipeg (seasonal) Calgary and Toronto (year-round) went on sale to the public. During winter months, WestJet continues to serve the seasonal Edmonton - Maui, Calgary - Honolulu, and Calgary - Maui flights with the 767-300ER aircraft. In April 2017, WestJet announced plans to launch an ultra-low-cost carrier in late 2017. The new airline would operate using Boeing 737-800 aircraft, and compete with new entrants to the market, such as Flair Airlines. The launch of the new airline, named Swoop, was delayed until June 2018. While announcing an expansion of the senior leadership team on January 11, 2018, Gregg Saretsky reconfirmed the airline's strategic goal to become a global, full-service carrier. On March 8, 2018, the CEO of WestJet, Gregg Saretsky retired. He was replaced by company vice-president, Ed Sims. On May 8, 2018, WestJet announced that it would be adding the Boeing 787-9 Dreamliner to its fleet. The first aircraft is expected to be delivered to the airline in early 2019. On May 10, 2018, WestJet's unionized pilots voted 91 percent in favour of strike action. The key issue in negotiations is outsourcing work to operate the new Swoop carriers. On May 25, 2018, WestJet and the Air Line Pilots Association (ALPA) agreed to a settlement process through the Federal Mediation and Conciliation Service. On May 14, 2018, WestJet announced new Premium Economy seats to replace the Plus seats, their current premium economy offering. The new seats will feature a wider 2-2 configuration on the Boeing 737 aircraft. Entry into service on the Boeing 737 MAX 8 aircraft was planned for fall 2018, and the rest of the Boeing 737s would follow in 2019. However, entry into service has been delayed until winter 2018. On May 31, 2018, WestJet operated its first flight to mainland Europe with the inaugural flight from Halifax Stanfield International Airport to Paris' Charles de Gaulle Airport. On October 12, 2018, WestJet announced its new branding, along with details on the arrival on the Boeing 787-9. WestJet changed its slogan from Owners Care to Love where you're going, announced a new logo (however, such logo was seen in May with the announcement of the Boeing 787 Dreamliner along with its livery), announced the Boeing 787 routes and launch dates, and an overall new brand image. Boeing 787 flights were announced to commence on April 28, 2019, with service from Calgary International Airport to London Gatwick Airport, with service to Paris and Dublin following. WestJet is operated by WestJet Airlines Ltd., a public company, incorporated and domiciled in Canada. Its shares are publicly traded on the Toronto Stock Exchange (TSX) under the symbol WJA. The parent company's accounts include various directly wholly owned subsidiaries, also incorporated in Canada, including WestJet Vacations Inc., WestJet Encore Ltd. and Swoop. WestJet Encore is WestJet's affiliated regional airline, which commenced operations on June 24, 2013, with a fleet of Bombardier Q400 twin-turboprop aircraft. WestJet Encore was granted its separate Air Operator Certificate from Transport Canada, on June 12, 2013. It was set up to serve smaller communities in Canada. WestJet Link is a subsidiary of WestJet launched in June 2018. Operated by Pacific Coastal Airlines, WestJet Link service from the parent airline's hub at Calgary to smaller communities, using Saab 340B aircraft which are smaller than the Q400 aircraft operated by Encore. Swoop is a new affiliated airline of WestJet that aims to be an ultra low-cost carrier (ULCC). It was officially announced on September 27, 2017, and commenced operations on June 20, 2018. Swoop currently operates a fleet of Boeing 737-800 aircraft. WestJet aircraft at Edmonton International Airport. WestJet and WestJet Encore currently fly to 108 destinations in 25 countries throughout North and Central America, the Caribbean and Europe including 36 cities in Canada and 23 in the United States. 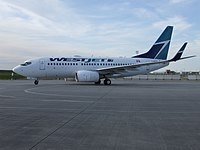 WestJet's largest hub in terms of daily departures is Toronto Pearson International Airport, the airline's main connection point in Eastern Canada and Calgary International Airport, the airline's main connection point in Western Canada. WestJet provides the most Canadian flights to Las Vegas and Orlando, offering non-stop routes (some of them seasonal) from nine Canadian cities to Las Vegas and eleven to Orlando. Since 2008, WestJet is the largest international carrier, by volume of passengers, flying into Las Vegas. WestJet also serves 20 destinations in the Caribbean and seven in Mexico, some on a seasonal basis. In July 2015, WestJet announced flights to London Gatwick Airport operated by Boeing 767 aircraft, which had not previously been part of the airline's fleet, starting spring 2016. In January 2018, WestJet announced its first flight to mainland Europe. WestJet will fly between Halifax and Paris beginning in May 2018. The airline will serve this route with its new Boeing 737 MAX 8 aircraft. In October 2018, new international destinations and routes were announced. Starting in 2019, WestJet will begin direct flights from Calgary to Dublin and Paris. WestJet will be using its new Boeing 787 Dreamliner aircraft to fly the new routes. In addition, the current Calgary to London Gatwick Airport route, currently served by WestJet’s Boeing 767 aircraft, will then be served by their new Boeing 787 Dreamliner aircraft. At the end of October, WestJet also announced two new destinations. They will begin flights between Calgary and Atlanta, WestJet’s expected joint-venture carrier Delta Air Lines largest hub, in March 2019. WestJet will be the only carrier operating a direct route between Calgary and Atlanta. They also announced flights between Toronto and Barcelona, their second destination in mainland Europe beginning in May 2019. In 1999, WestJet was in talks regarding a possible 'feeder' arrangement for Air Canada's network. These talks were apparently discontinued when Air Canada went forward with acquisition of Canadian Airlines the following year. In 2005, WestJet began a limited interline agreement with Taiwan-based China Airlines, in part to test the company's capability to partner with other carriers. In August 2006, in a Globe and Mail interview, then-WestJet CEO Sean Durfy stated that WestJet was in talks with Oneworld. Durfy said that, if a deal with Oneworld were reached, it would allow WestJet to maintain its scheduling flexibility; Durfy was later quoted in 2007 saying that a deal for WestJet to join the Oneworld alliance was unlikely. Despite this, WestJet did formalize a deal with Oneworld in November 2008, to partner on sales of travel to corporate and business travelers. In July 2008 WestJet announced it had signed a memorandum of understanding to build a distribution and codeshare agreement with U.S.-based Southwest Airlines. However, in April 2010 WestJet announced that the airline partnership with Southwest Airlines was terminated and in October 2010, WestJet partnered with American Airlines instead and later added Delta Air Lines. In light of a possible joint venture between WestJet and Delta, American and WestJet ceased their codeshare agreement on July 31, 2018. In 2006 WestJet announced it has been in talks with 70 airlines around the world interested in an interline or codeshare agreement. In 2017, WestJet, easyJet and Norwegian Air Shuttle teamed up to provide direct connections at London Gatwick Airport. The scheme, dubbed by EasyJet as "Worldwide by easyJet" allows passengers to connect from easyJet flights to American and Canadian destinations with WestJet and Norwegian. As of June 2018, WestJet has 27 interline agreements and 16 codeshare agreements. On December 6, 2017, WestJet and Delta Air Lines signed a preliminary memorandum of understanding to extend their current codeshare agreement into a joint venture, pending regulatory and board approval. On July 19, 2018, WestJet and Delta Air Lines signed a definitive 10-year agreement into a joint venture between the two airlines. This joint venture will serve more than 95% of the Canada-U.S. demand. The airlines' current frequent flier programs will also be updated to be more closely aligned, and the airlines will be co-located at key hub airports. WestJet's mainline fleet is all manufactured by Boeing, with the following aircraft (as of March 2019). Boeing 737 MAX 7 — 22 — 12 134 146 Deliveries begin 2021. Boeing 737 MAX 10 — 12 TBA Deliveries begin 2022. Boeing 767-300ER 4 — — 24 238 262 Former Qantas aircraft. Entry into service February 20, 2019. The mainline fleet currently consists exclusively of Boeing aircraft, while wholly owned subsidiary Encore flies Bombardier Dash 8 Q400s. 20 examples were originally ordered with options for up to 25 more. The first two examples were delivered in mid-June 2013. Scheduled passenger service on these aircraft began on June 24, 2013. The first Boeing 737-700 delivery took place in 2001, and the first deliveries of Boeing 737-600 and Boeing 737-800 aircraft began in 2005, with the final 737-600 aircraft delivered in September 2006. Boeing confirmed on August 2, 2007 that WestJet had placed an order for 23 Boeing 737 Next Generation aircraft. The order was primarily for Boeing 737-700 but with conversion rights to Boeing 737-800s. WestJet was to be the Boeing launch customer for the winglets on the 737-600, but announced in their second-quarter 2006 results that they were not going to move ahead with those plans. WestJet CEO Clive Beddoe cited the cost and time associated with their installation was not warranted as the -600 aircraft are primarily used for short-haul routes. As a result of the abandonment of the program to install winglets on these aircraft, WestJet incurred a one-time charge of approximately $609,000. In the winter season, WestJet has temporarily wet leased Boeing 757 aircraft to expand service between Alberta and Hawaii. From February through April 2011, a single aircraft was leased from North American Airlines for this purpose; in the winter of 2011-12, a single aircraft was leased from Thomas Cook Airlines. For the winter seasons from 2012 to 2015, this has been expanded to two Thomas Cook aircraft. In April 2013, it was announced that WestJet would sell 10 of their oldest 737-700s to Southwest Airlines, and purchase 10 737-800s to modernize and increase capacity of their fleet. In May 2014, CEO Gregg Saretsky announced that WestJet was considering acquiring wide-body aircraft to operate long-haul international routes. By July of the same year, Saretsky confirmed that wide-body service would begin in 2015. In late June 2014, WestJet announced that the wide-body aircraft were to be Boeing 767-300ER with four used airframes acquired from Qantas. The four Boeing 767s are of an average 25 years old, which means that they need frequent repairs and downtime for sourcing parts. This resulted in a poor on-time performance of 38 percent in 2016, costing the airline approximately $5 million in the second quarter of 2016. In 2017, Westjet reduced the number of flights from Winnipeg and Edmonton to reduce utilization of the planes for the summer 2017, to cope with any unforeseen delays or cancellations. In late December 2016, 77% of WestJet pilots approved a new deal that will increase pay for pilots flying wide-body aircraft such as the Boeing 767, 787 and Airbus 330. In a statement, the airline said that they were seeking more large aircraft with the intention of adding new destinations. Saretsky also stated that he hoped for wide-body growth to be responsible, but quick. As of May 2, 2017, WestJet announced the purchase of up to 20 Boeing 787-9 Dreamliner aircraft; 10 are firm orders with deliveries from 2019 through 2021, and 10 are options for delivery between 2020 and 2024. In early 2005 it was announced that the Boeing 737-200 fleet would be retired and replaced by newer, more fuel-efficient 737 Next Generation series aircraft. On July 12, 2005, WestJet announced that it had completed the sale of its remaining Boeing 737-200 to Miami-based Apollo Aviation Group. On January 9, 2006, the last Boeing 737-200 was flown during a fly-by ceremony at the WestJet hangar in Calgary, piloted by WestJet founder Don Bell and was a charter flight from Las Vegas to Calgary. In 2003 and 2004, WestJet donated two of its 737-200s to post-secondary schools in western Canada, one to the British Columbia Institute of Technology and a second to the Southern Alberta Institute of Technology's Art Smith Aero Centre. WestJet's aircraft are painted white except for the lettering on the fuselage, wings and vertical stabilizer, except for special examples as noted below. The tail is divided roughly into slanted thirds, coloured (from front to back) navy blue, white and teal. This pattern is used on the outside of the blended winglets at the end of the wings while, on the inside, the winglets are painted white with "WestJet.com" in dark blue lettering. In February 2010 WestJet introduced a special livery on one Boeing 737-800 aircraft promoting its customer-service promise, or "Care-antee", in both English and French. This aircraft also featured a new tail design. In 2013, the Care-antee aircraft underwent a second livery change in partnership with Disney, featuring Mickey Mouse from the movie Fantasia and adopting the name "Magic Plane". A second Disney aircraft was completed in 2015, named "Frozen Plane", with characters Elsa and Anna on the vertical stabilizer and a similar theme in the cabin. In May 2018, WestJet unveiled a new livery, the first significant change since the inception of the company. It includes a new font for the word "WestJet"; written across the middle of the aircraft fuselage is "The Spirit of Canada" on the port side and "L'esprit du Canada" on the starboard side. An updated, stylized maple leaf on the aircraft tail is also included. On Jan 17, 2019, WestJet's first dreamliner was delivered with the name 'Clive Beddoe', a tribute to its founder, and current chairman of the board of directors. The aircraft is painted in its new livery. The "Care-antee" special livery, photographed in 2011. "Care-antee" was repainted as the "Magic Plane"; a Fantasia-themed livery promoting Walt Disney World. The second Disney-themed aircraft, the "Frozen Plane" revealed in October 2015, is adorned with characters from the 2013 movie Frozen. A #100Boeing737NG subtitle adorns the lower fuselage of the 100th Boeing 737 Next Generation aircraft received by the airline. Seatback inside a WestJet 737. The majority of WestJet's 737-600 aircraft feature a 5-inch seat-back TV. The system utilizes satellite TV only available for use while the aircraft is flying above Canada. Channels include various news, sports and children's channels such as Global TV, CBC, TSN, and a WestJet Channel, which shows a regional map with the aircraft's location, GPS derived altitude and groundspeed. The TV control is in the armrest. This system is currently being retired in favor of WestJet Connect. WestJet's 767, 737 MAX, 737-700, -800 and select -600 aircraft feature WestJet Connect, an inflight entertainment system where passengers use their own mobile devices and laptops. The service includes free access to hundreds of TV shows and movies, paid access to the internet, and access to USB and 110V power at every seat. WestJet's 787 aircraft will feature WestJet Connect and large touchscreen seatback monitors at every seat. The monitors will include access to hundreds of TV shows and movies, music, magazines, and games like Angry Birds World Tour, and many more. Complimentary headphones are also included at every seat, with business and premium class offering noise-cancelling headphones and economy with standard earbuds. USB and 110V power are also included at every seat. WestJet Encore aircraft are not equipped with any inflight entertainment. On flights less than four hours, WestJet offers complimentary beverages and snacks. Alcoholic beverages are available for purchase. On flights four hours and more, WestJet offers complimentary beverages and snacks, and a buy-on-board meal service in economy on all aircraft. In premium and business class, a complimentary meal and alcoholic beverages are included. When flying internationally on their 787, a complimentary meal is included in all classes. WestJet's 737-600 and -700 aircraft offer cold sandwiches, snacks, and alcoholic and non-alcoholic beverages. WestJet's 737-800, 737 MAX, 767 and 787 aircraft offer hot meals, snacks, and alcoholic and non-alcoholic beverages. Business class is offered on 787 aircraft and offer private pods, with direct aisle access. The seats feature electronic flat beds in a 1-2-1 configuration. Complimentary hot meals, alcoholic and non-alcoholic beverages are included. On international flights, an amenity kit is provided. WestJet's business class is the only airline in Canada with fully extendable privacy screens. Premium class is offered on all aircraft. It varies depending on aircraft type. On WestJet's 787, premium is in a separate, dedicated cabin. Larger seats with greater recline are offered in a 2-3-2 configuration. Complimentary hot meals, alcoholic and non-alcoholic beverages are included. A self-serve social area is also available. On international flights, an amenity kit is provided. On WestJet's 767, premium is in a separate, dedicated cabin. Larger seats with greater recline are offered in a 2-2-2 configuration. Complimentary hot meals, alcoholic and non-alcoholic beverages are included. On international flights, an amenity kit is provided. On WestJet's 737 MAX, premium is separated from economy with sky dividers. Larger seats with greater recline are offered in a 2-2 configuration. Complimentary hot meals, alcoholic and non-alcoholic beverages are included. On WestJet's 737-600, -700 and -800, premium is not separated from economy. Seats in premium are the first three rows, which include extra leg room, and a middle seat blocker. These seats are offered in a 3-3 configuration, with the middle seat blocked. WestJet is phasing all 737 aircraft from economy seating with a middle seat blocker to premium 2x2 seats. Complimentary cold sandwiches, alcoholic and non-alcoholic beverages are included. Economy class varies depending on aircraft type. On WestJet's 787, economy seats have a pitch of 31" and are offered in a 3-3-3 configuration. Each seat includes a pillow and blanket. Complimentary hot meals and non-alcoholic beverages are included when flying internationally. On WestJet's 767, economy seats have a pitch of 31" and are offered in a 2-3-2 configuration. Complimentary non-alcoholic beverages and snacks are included. On WestJet's 737 MAX, 737-600, -700 and -800, economy seats have a pitch of 31"-34" and are offered in a 3-3 configuration. Complimentary non-alcoholic beverages and snacks are included. WestJet does not operate its own lounges, however WestJet has agreements with third-party service providers to provide pay-per-use access for customers, and free access to Gold and Platinum members. WestJet is in the process of developing company owned and operated lounges in Toronto, Calgary and Vancouver, its three main hubs. In 2000, Clive Beddoe, Mark Hill, Tim Morgan and Donald Bell were given the Ernst & Young company's Entrepreneur of the Year award in Canada for their contribution to the Canadian airline industry[not in citation given]. WestJet was named one of Alberta's Top Employers by Mediacorp Canada Inc., in 2008,2009, 2010, 2012, 2013, 2014 and 2018 as one of Alberta's Top Employers by Mediacorp Canada Inc..
A 2009 poll by Léger Marketing found that WestJet is Canada's preferred airline. WestJet came in first place in the Airline Staff Service Excellence (North America) and second place in the Best Low-Cost Airline (North America) categories at the 2010 World Airline Awards. WestJet was ranked #5 in the 2017 Top Mid-Size & Low Cost Airlines in North America in TripAdvisor's Travelers' Choice Awards. WestJet was recognized as Canada's Best Airline in 2016, 2017 and 2018 in TripAdvisor's Traveller's Choice Awards. June 5, 2015 588 Boeing 737-600 A Boeing 737-600 (C-GWCT) flying from Toronto Pearson International Airport, overran the runway on arrival to Montreal Trudeau International Airport into the grass during heavy rain. The aircraft was not damaged, and there were no injuries. January 5, 2018 2425 Boeing 737-800 After its flight from Cancun to Toronto, the right wing of a Boeing 737-800 (C-FDMB) was struck while parked and on approach to the gate by a Sunwing Airlines Boeing 737-800 (C-FPRP) being towed at Toronto Pearson International Airport. A fire on the Sunwing aircraft's APU was put out by fire crews at the airport. 168 passengers and 6 crew were onboard the WestJet aircraft and were evacuated but none were injured; the Sunwing aircraft had no passengers as it was being re-positioned. January 18, 2019 173 Boeing 737-700 WestJet flight 173 was taxiing to the runway at Edmonton International Airport scheduled to depart to Victoria International Airport when the Boeing 737-700 (C-FUWS) slid off the taxiway due to icy conditions. All passengers and crew were deplaned using bridge stairs and were transported back to the terminal by bus. There were no injuries. ^ a b c "Welcome to the new WestJet". WestJet. October 12, 2018. Retrieved October 13, 2018. ^ "WestJet Employee strength at Statista". ^ "." CAPA. Retrieved on October 3, 2017. "WestJet Airline Profile." ^ "Canadian Low-Cost Carrier Departs From No-Frills Model". Wall Street Journal. July 28, 2015. Retrieved November 17, 2015. ^ "2017 WestJet Annual Report" (PDF). ^ "WestJet, Air France, KLM work toward code-share". USA Today. February 5, 2009. Retrieved February 23, 2009. ^ a b "WestJet unveils its Dreamliner 'Spirit of Canada' to the world". Retrieved June 15, 2018. ^ "Segment guests" (PDF). 2017 WestJet Annual Report. ^ "WestJet 2018 Annual Report" (PDF). Retrieved February 11, 2019. ^ Reed Business Information Limited. "WestJet to add four 767s, exercise five Q400 options". Retrieved August 10, 2015. ^ "Contact WestJet". WestJet. Retrieved November 2, 2011. ^ "WestJet Returns September 1996". CBC News Edmonton. Uploaded by:FDematos82. September 1996. Retrieved June 28, 2010. ^ "WestJet IPO makes a strong debut". CBC News. July 13, 1999. Archived from the original on November 7, 2012. Retrieved February 23, 2009. ^ Keyser, Tom (October 18, 2000). "WestJet's fun culture deserves to be copied". Business Edge. Retrieved February 27, 2009. ^ Sorensen, Chris (July 25, 2007). "'Mr. WestJet' stepping down as CEO - again". Toronto Star. Retrieved February 27, 2009. ^ "WestJet to return to Sudbury" (Press release). Sudbury Star. November 1, 2016. Retrieved December 19, 2016. ^ "Transat and WestJet agree amiably to terminate air transportation agreement" (Press release). WestJet. February 13, 2009. Archived from the original on January 15, 2013. Retrieved February 21, 2009. ^ "Air Canada suing WestJet". The Globe and Mail. Toronto. April 6, 2004. Archived from the original on April 29, 2009. Retrieved February 23, 2009. ^ "WestJet and Air Canada Issue Joint Press Release" (Press release). Marketwire. May 29, 2006. Retrieved February 23, 2009. ^ "WestJet shifts operations to Toronto from Hamilton". CBC News. January 14, 2004. Archived from the original on August 16, 2009. Retrieved February 22, 2009. ^ "WestJet to begin flying to U.S cities in October". CBC News. February 4, 2004. Archived from the original on March 22, 2009. Retrieved February 22, 2009. ^ "2005 WestJet Annual Report" (PDF) (Press release). WestJet. 2006. p. 14. Retrieved July 1, 2010. ^ "WestJet welcomes its WestJetters "home"" (Press release). CNW Group. May 4, 2009. Retrieved May 8, 2009. ^ Jang, Brent (February 20, 2010). "WestJet closing gap with Air Canada". The Globe and Mail. Toronto. Retrieved February 20, 2010. ^ "WestJet updates advisory for guests travelling to and from Mexico" (Press release). CNW Group. April 28, 2009. Archived from the original on June 8, 2010. Retrieved July 1, 2010. ^ "WestJet announces service to Bermuda" (Press release). CNW Group. November 23, 2009. Retrieved January 27, 2010. ^ Ladurantaye, Steve (March 16, 2010). "Shakeup at WestJet as CEO Sean Durfy quits". The Globe and Mail. Toronto. Retrieved July 1, 2010. ^ a b "WestJet leases Boeing 757-200 to provide additional non-stop service from Alberta to Hawaii" (Press release). WestJet. December 21, 2010. Retrieved October 22, 2010. ^ a b "WestJet to lease a Boeing 757-200 for Hawaii". Seattle Post-Intelligencer. December 23, 2010. Retrieved December 24, 2010. ^ "Winnipeg airline passenger wins 3rd baggage complaint". CBC News. March 31, 2010. ^ Waldie, Paul (November 25, 2010). "Regulator orders WestJet to boost lost luggage compensation". Globe and Mail. Toronto. ^ "Court won't hear WestJet appeal on luggage liability". CTV News. Archived from the original on March 9, 2012. ^ "WESTJET AIRLINES LTD. v. CANADIAN TRANSPORTION AGENCY ET AL". Federal Court of Appeal. March 10, 2011. Archived from the original on September 28, 2011. Retrieved May 7, 2011. ^ "WestJet ordered to pay for damaged bag". CBC. July 23, 2010. ^ "Agency quashes WestJet limit on baggage claims". Winnipeg Free Press. ^ "WestJet announces service to Orange County". WestJet. January 26, 2011. Retrieved January 28, 2011. ^ Jang, Brent (November 23, 2011). "WestJet wins coveted LaGuardia slots in New York City - The Globe and Mail". The Globe and Mail. Toronto. ^ "WestJet | WestJet announces service to LaGuardia". Newswire.ca. Retrieved May 23, 2012. ^ "Céad míle fáilte! WestJet welcomes Dublin to our network" (Press release). WestJet. November 15, 2013. Retrieved November 23, 2013. ^ "Westjet charters Atlas Air 747 to alleviate YYZ weather backlog - Skies Magazine - Aviation is our Passion". Retrieved August 10, 2015. ^ Lu, Vanessa (July 7, 2014). "WestJet to fly wide-body planes in 2015". Toronto Star. ^ Keenan, Greg (July 7, 2014). "WestJet eyes international expansion with plane purchase". The Globe and Mail. ^ Kaufmann, Bill (August 27, 2015). "Calgary-based airline WestJet welcomes Boeing 767-300 into fleet". Calgary Sun. Archived from the original on March 10, 2016. Retrieved September 17, 2018. ^ "WestJet takes delivery of first of 4 Boeing 767-300 aircraft". Financial Post. August 28, 2015. ^ "WestJet to Launch Service to London-Gatwick". Huffington Post Canada. June 16, 2015. Retrieved June 18, 2015. ^ "WestJet to offer 1st transatlantic flights with bigger planes to London next spring". cbc.ca. Retrieved October 12, 2016. ^ "WestJet plans to launch new discount airline". Maclean's. April 20, 2017. Retrieved April 21, 2017. ^ "WestJet to launch 'ultra-low-cost' no-frills carrier". CBC News. April 20, 2017. Retrieved April 22, 2017. ^ "WestJet delays launch of discount airline until 2018". CBC News. August 1, 2017. ^ "WestJet Prepares for Global Expansion". WestJet. Retrieved January 20, 2018. ^ "WestJet Airlines chief executive Gregg Saretsky retires, replaced by Ed Sims". CTV News. March 8, 2018. Retrieved March 8, 2018. ^ "WestJet Pilots Vow Not to Disrupt Long Weekend as a Goodwill Gesture". CTV News. May 10, 2018. Retrieved May 11, 2018. ^ "Settlement process reached between WestJet Pilots and WestJet". Retrieved June 15, 2018. ^ "Comfort Redefined". WestJet. Retrieved August 31, 2018. ^ "WestJet launches first flight to the City of Light". Retrieved June 15, 2018. ^ "CUPE files application with CIRB to represent WestJet flight attendants | CTV News". www.ctvnews.ca. Retrieved January 28, 2019. ^ Jul 31, David Bell · CBC News · Posted:; August 1, 2018 8:00 PM MT | Last Updated:; 2018. "3,000 WestJet cabin crew employees officially unionized, CUPE says | CBC News". CBC. Retrieved January 28, 2019. ^ a b c d e f "2016 Annual Report" (PDF). February 6, 2017. Retrieved September 26, 2017. ^ Deveau, Scott (November 7, 2012). "WestJet's new regional carrier Encore aims for mid-June takeoff". Financial Post. Retrieved January 17, 2013. ^  World Airline News, WestJet Encore receives Air Operator Certificate. Retrieved 2018-01-29. ^ "WestJet Link launch delayed". www.newswire.ca. ^ "WestJet introduces WestJet Link". WestJet. November 24, 2017. Retrieved November 25, 2017. ^ "Low-cost airline Swoop's maiden flight lands in Abbotsford". Retrieved June 29, 2018. ^ "Management's Discussion and Analysis of Financial Condition and Operating Results for the years ended December 31, 2017 and 2016" (PDF). www.westjet.com. Retrieved March 22, 2018. ^ Russell, Scott (May 28, 2009). "Fiscal year 2009 (Starts July 2008) Enplaned and Deplaned International Passengers" (PDF). Clark County Department of Aviation. Archived from the original (PDF) on July 14, 2011. ^ Velotta, Richard (April 30, 2010). "WestJet is McCarran's biggest growth story". Las Vegas Sun. Retrieved July 1, 2010. ^ "WestJet announces service to London Gatwick". mediaroom.com. ^ "WestJet heads to Paris and London from Halifax". www.newswire.ca. ^ "WestJet Adds Toronto-Barcelona and Calgary-Atlanta for 2019". TravelPulse. ^ Hegeman, Holly (March 11, 1999). "For Canadian Airlines, More Money Isn't the Answer; New Management Is". TheStreet.com. Retrieved July 16, 2009. ^ Karp, Aaron (November 20, 2007). "WestJet in talks with Air France regarding interline agreement". Air Transport World Online. Retrieved August 1, 2009. ^ Jang, Brent (August 31, 2006). "WestJet Looks to Fly Higher with Oneworld". The Globe and Mail. Toronto. Archived from the original on September 2, 2006. Retrieved October 31, 2006. ^ "WestJet says link up with alliance not likely". Toronto Star. June 6, 2007. Retrieved February 23, 2009. ^ "oneworld and WestJet introduce global travel program for businesses in Canada" (Press release). WestJet. November 4, 2008. Archived from the original on May 24, 2015. Retrieved February 23, 2009. ^ Group, Travelweek (March 9, 2018). "Analysis: WestJet and Delta want to expand with a joint venture. What's the impact? - Travelweek". Travelweek. Retrieved June 15, 2018. ^ Group, Travelweek (December 27, 2017). "WestJet, AA move to cut ties in wake of Delta deal - Travelweek". Travelweek. Retrieved June 15, 2018. ^ Jang, Brent (April 1, 2010). "WestJet chief laying the groundwork". Globe and Mail. Toronto. Retrieved April 1, 2010. ^ "WestJet shopping for global partners". Globe and Mail. Toronto. June 3, 2010. Retrieved June 3, 2010. ^ "Our airline partners". CAPA. Centre for Aviation. Archived from the original on October 29, 2016. Retrieved October 29, 2016. ^ "Delta and WestJet agree to form joint venture". Cision. WestJet. Retrieved June 2, 2018. ^ "Canadian Civil Aircraft Register". Transport Canada. Retrieved October 10, 2017. ^ "Boeing 737-600 Operators". www.planespotters.net. ^ "Boeing Commercial Airplanes – Orders and Deliveries – 737 Model Summary". boeing.com. Boeing. June 30, 2016. Retrieved August 4, 2016. ^ a b "WestJet's 2018 Second Quarter Report" (PDF). ^ "WestJet goes widebody: Boeing 767 enters service - Skies Magazine". skiesmag.com. November 6, 2015. Retrieved October 12, 2016. ^ "WestJet to purchase Boeing 787-9 Dreamliners". newswire.ca. newswire.ca. May 2, 2017. Retrieved May 2, 2017. ^ "WestJet receives keys to new planes as it begins planning for 'march east'". Calgary Herald. June 7, 2013. Archived from the original on June 9, 2013. Retrieved June 7, 2013. ^ "WestJet Encore Celebrates Inaugural Q400 Flight from Calgary". Airline Reporter. June 24, 2013. Retrieved June 24, 2013. ^ "Boeing Confirms WestJet Order for 23 Next-Generation Boeing 737 Airplanes" (Press release). The Boeing Company. August 2, 2007. Archived from the original on March 16, 2009. Retrieved February 23, 2009. ^ "Boeing 757 in WestJet Airlines history". Airfleets.net. Retrieved January 17, 2013. ^ "Non-stop flights between Alberta and Hawaii on Thomas Cook Airlines". WestJet. Retrieved January 17, 2013. ^ "Boeing 757 Active with WestJet Airlines". Airfleets.net. Retrieved January 17, 2013. ^ "WestJet plans to fly wide-body planes by fall 2015". CBC News. July 7, 2014. Retrieved August 10, 2015. ^ a b c d Johnson, Tracy (May 30, 2017). "WestJet cuts back on London flights to try to curb delays and cancellations". CBC News. Retrieved July 13, 2017. ^ Johnson, Tracy (January 5, 2017). "With pilots deal, WestJet set to expand long-haul flights". CBC News. Archived from the original on January 6, 2017. Retrieved January 8, 2017. ^ Karp, Aaron (December 27, 2016). "WestJet to pursue more widebody aircraft following pilots' approval". Air Transport World. Archived from the original on December 29, 2016. Retrieved January 8, 2017. ^ "WestJet donates 737-200 aircraft to BCIT Aerospace" (Press release). British Columbia Institute of Technology. October 1, 2003. Archived from the original on July 3, 2004. Retrieved February 23, 2009. ^ "WestJet Donates Boeing 737-200 Aircraft to SAIT's Art Smith Aero Centre for Training and Technology" (Press release). CCNMatthews. October 21, 2004. Retrieved March 5, 2011. ^ "Westjet Fleet Details and History". planespotters.net. Retrieved October 26, 2018. ^ Hounstow, Greg (October 10, 2015). "Our second custom-painted aircraft, inspired by Disney's Frozen". WestJet. Retrieved October 19, 2015. ^ "WestJet unveils its Dreamliner 'Spirit of Canada' to the world". Cision. WestJet. Retrieved June 2, 2018. ^ "Airport lounges". Westjet.com. Retrieved August 15, 2017. ^ "WestJet Tops List of Canada's 10 Most Admired Corporate Cultures" (Press release). CNW Group. January 16, 2008. Archived from the original on June 9, 2011. Retrieved February 22, 2009. ^ "Alberta's top 40 places to work". Calgary Herald. October 18, 2008. Archived from the original on February 8, 2009. Retrieved February 23, 2009. ^ "Alberta's Top Employers (2018)". www.canadastop100.com. ^ "WestJet is Canada's preferred airline" (Press release). WestJet. June 9, 2009. Archived from the original on May 30, 2012. Retrieved June 9, 2009. ^ "WestJet wins award for Airline Staff Service Excellence North America at 2010 SKYTRAX World Airline Awards". Worldairlineawards.com. Archived from the original on December 26, 2010. Retrieved March 3, 2011. ^ "Virgin America is named the Best Low-Cost Airline North America at 2010 SKYTRAX World Airline Awards". Worldairlineawards.com. Archived from the original on December 26, 2010. Retrieved March 3, 2011. ^ "TripAdvisor Names The Best Airlines In The World". ^ "Top Airlines By Country 2018 - TripAdvisor". ^ "TripAdvisor Recognizes World's Best Airlines With 2018 Travelers' Choice Awards". Archived from the original on June 15, 2018. ^ "Top Airlines by Country 2018 - TripAdvisor Travellers' Choice Awards". www.tripadvisor.ca. ^ "World's Best Low-Cost Airlines 2018". SKYTRAX. Retrieved July 21, 2018. ^ "World's Best Airlines 2018 by Region". SKYTRAX. Retrieved July 21, 2018. ^ "Aviation Investigation Report" (PDF). Transportation Safety Board of Canada. 2017. Retrieved 2018-01-28. ^ Arnone, Annie (January 5, 2018). "WestJet passengers evacuated after plane clips jet on Pearson tarmac". The Star. Retrieved January 5, 2018. Retrieved 2018-01-28. ^ Transportation Safety Board of Canada. "Aviation Investigation A18O0002". www.tsb.gc.ca. Retrieved May 23, 2018.